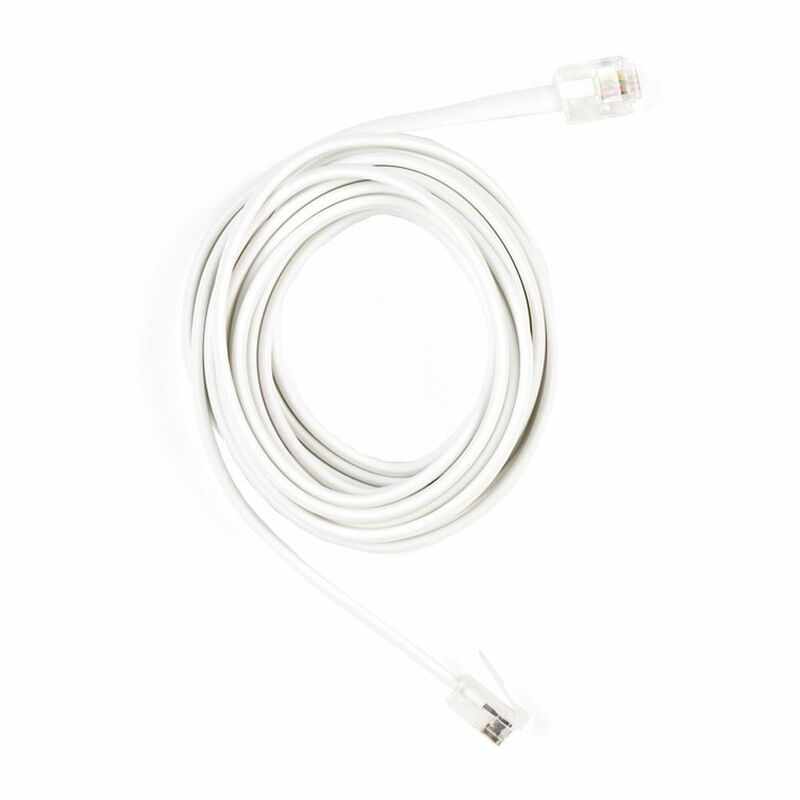 The CE-TECH 7 ft. White Ultra-Thin Phone Line Cord is flexible and lies flat under carpets and along baseboards when connecting telecom devices to a phone jack. The CE TECH HDC804GWH Energy Savings Surge Protector is ideal for home entertainment and Home Office protection with 3600 joules, 8 outlets, and a 4 ft. cord. The surge protector provides protection for HDTVs, cable/satellite receivers, personal computers, cable modems, phones/fax/DSL, printers, stereos, and CD/DVD players. Master controlled outlets reduce energy costs by turning off idle peripherals. The HDC804GWH has a single master outlet that will control up to 5 devices attached to the master controlled outlets. When the master device is turned off or goes into power saving standby mode, the master controlled outlets will automatically shut off power to the attached devices to save energy. The HDC804GWH features all 8 outlets with wide space for large AC adapters, MOV technology to guard the surge protector and connected electronics against line abnormalities and lightning surges, while EMI/RFI filters block unwanted line noise. 7 ft. Phone Line Cord in White The CE-TECH 7 ft. White Ultra-Thin Phone Line Cord is flexible and lies flat under carpets and along baseboards when connecting telecom devices to a phone jack. 7 ft. Phone Line Cord in White is rated 4.6 out of 5 by 8. Rated 4 out of 5 by ROOTBOUND from When I first connected it, I was not getting a... When I first connected it, I was not getting a signal that the connection was working and thought that it was defective. However, after some jiggling plus disconnecting and reconnecting, the connection was made. It gives a solid connection with a clear tone. I am quite happy with my purchase. Rated 5 out of 5 by greenthumbah from Excellent product. Very sturdy. We go through a lot of these because out Cockatoo chews them in t... Excellent product. Very sturdy. We go through a lot of these because out Cockatoo chews them in two. Since we have to use so many, it's nice to have a source that is handy and inexpensive yet a quality product.